This scene has all the whistles and bells scratch built into it, quite literally. In the streets you'll find horses and wagons, Model T & Model A cars and trucks and taxis, streetcars, cable cars, peddlers, street vendors, and people everywhere... this is turn-of-the-century gridlock! The inhabitants are quietly serenaded by era appropriate music wafting through the streets and buildings. In the background you will hear horns, bells and even the occasional old time crank fire siren. There is plenty of activity in this one. Its a lush, vivid, and busy image, even during the most quiet passages. 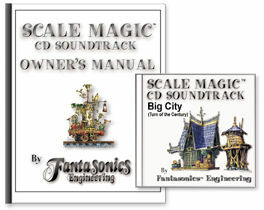 And as with all our soundtracks, its all created with out proprietary Scale Magic imaging!